The Juki industrial "box feed" system has been brought to the home sewing machine. Our box feed allows you to create perfect high-quality stitches on all types and fabrics. Allowing for greater versatility Juki now offers assigned foot control options. With the ability to assign function to the heel side of the foot controller you can now lift the presser foot, trim threads, reverse stitch or single stitch by pressing on the heel side of the foot controller. Also allowing for no special settings you have complete control to customise your machine to best fit you. When you stop sewing the needle stops in the down position and the presser foot automatically lifts to allow for fabric movement. Sew corners or pivot with ease, when you resume sewing the presser foot automatically lowers for continuous smooth sewing. For the lock stitch at the start and the end of sewing, you can choose two kinds of "reverse stitch" and "lock stitch". 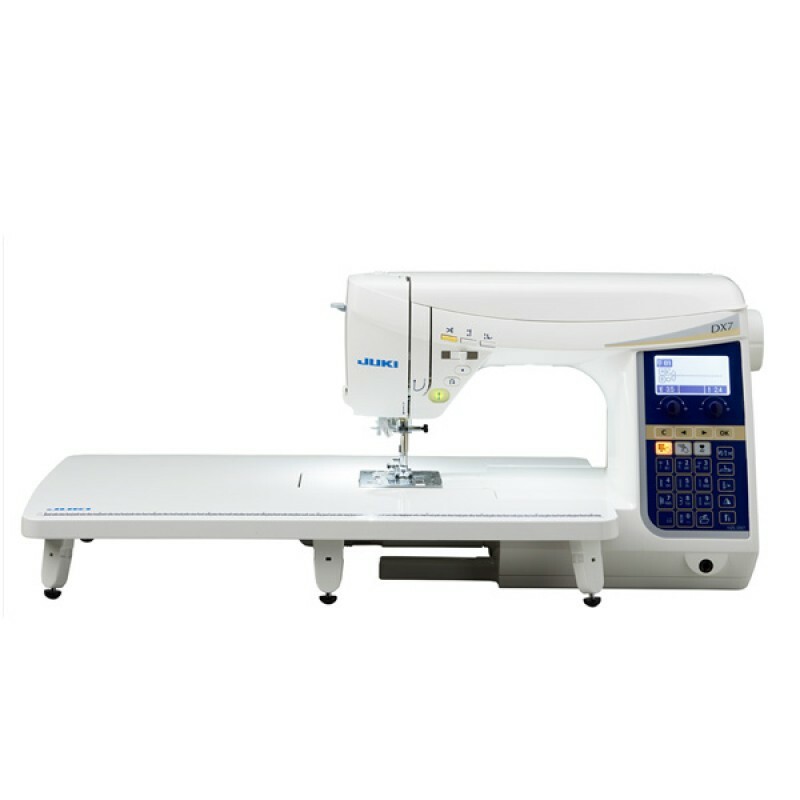 If you press the lockstitch button in the middle of a sewing pattern, the machine stops after sewing one cycle of the pattern. By pressing and holding the needle up/down button, you can sew slowly. Sew corners, starts and stops with precision. Presser foot can be raised and lowered by the knee-lifting lever. Presser foot lift is up to 0.5"(12mm) when the lever is used. When the foot is raised to the maximum height, you can also switch it back from automatic operation (button) to manual operation (lever). Simply place the thread in the guide and lower the level. Easily and quickly thread a needle with one hand. 287 stitches, 4 alphabets, sensor buttonholes with adjustable cutting width, automatic tension, stop/ start with adjustable speed, two LED lights, memory function, hard cover, wide extension table, knee lifter, 1050 stitches per minute, automatic pivot foot, built in straight stitch needle plate, floating stitch function. Foot control can trim the threads, stitch on the spot, sew half stitch, sew a single stitch and raise and lower the presser foot.